Once we enter into a photograph, even for a fleeting glance, we become changed. And if we take the time to look around ‘in there’, imagining the view to the left and right, farther off in the horizon and even back behind us, we can be there with the person who looks out to us. As she/he looks into the camera, we look back to her/him through the lens of the photographer; on a clear day, time and space melt in between. Most of the photographs that I have seen on writer/journalist Paul Seesequasis’ Facebook postings of First Nations people appear to imply an agreeable exchange between the camera operator and the subject; a mutual collaboration from one side of the lens to the other. That agreement might be the major difference between this archival collection and other pictorial exposés of rural and northern life in Canada, Nunavut and south of the Medicine Line. Although political, economic, and even geological historical events might be found inside those frames, these are not the perceived focus in the Seesequasis’ photo project. Perhaps equally important, these photos do not speak of relocations of aboriginal peoples from their traditional hunting and fishing territories. Unlike official archival collections of the past, these photographs feature a rich domestic life, the joy of living and spiritual presence. The collection shows family life and activities of daily life in times of peace, in rural or extreme northern settings. The themes are ones that everyone can find in their family albums. It also forms part of that bigger history of life inside First Nations communities and a sharing of culture. To describe the profound impact of any photograph can be difficult. In this specific project, I both ‘do not know’ the people in the photographs, and I know them. I know some of the time periods firsthand, and I know others from looking through my own family’s albums; archive searches; from studying; and from living some of those events myself. 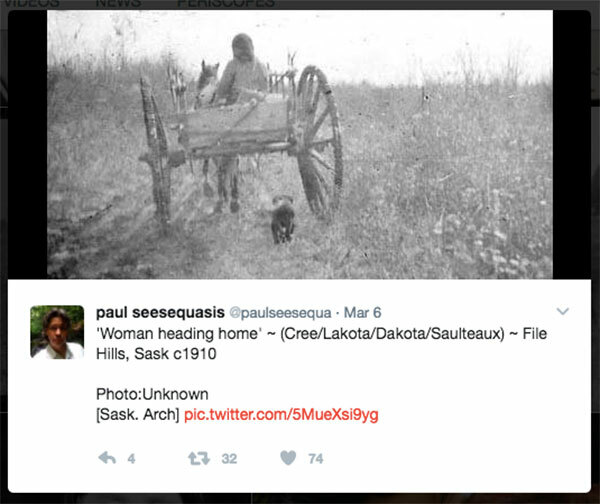 For several months I have opened Facebook to see the archival postings of Paul Seesequasis. I don’t pass a lot of time on Facebook, I missed some but saw many. During that time, I felt that these photos bring us all to that time; we can share what was happening: We take the wagon home from the blueberry field, laugh with the children and dance in celebration at a community party. The images come from a time when, if someone had a camera, it was a special and important gesture to record an event and to get the photos developed for the album. And yet, they are more than what some call ‘snapshots’. I wanted to write something about specific photographs in this collection but found that I could not say anything without beginning a whole history of the photograph in which each of these would belong. In the end, I look forward to seeing what Paul Seesequasis says in his book about his photographic posts and the people included in this archival project. The Medicine Line, has traditionally been a well travelled North/South route for Native Americans visiting kin above and below the 49th Parallel.